I ended up picking one up and sacrificing my Gladiator. I would think much like the F-22 and F-35 the - REDACTED - deploys its 2x Fixed guns from inside to fire then closes up again to keep the stealth profile at maximum. Also it definitely seems like a single seat bomber which also looks like its probably smaller than the pictures would make it appear. I also ended up getting rid of a few ships this week and got a Hornet again. So Im sitting on my Vanguard (with Harbinger upgrade option), F7C Hornet and our new stealthy friend. Also still have $90 in account currency to pickup something else...Since I have the fighter\bomber game covered fairly well. Was looking at a Reliant Kore but Kamikazi's point above makes me want to eliminate that. So maybe Aurora Clipper so I have a light duty hauler available, or I spend the $10 extra and go for a Cutlass Black. The Hull A or B would be the best cargo hauler for the price but I dont like the idea of flying a defenseless hauler. Thoughts? If you don't like the idea of flying a defenseless hauler (and I don't as well) I would recommend the two ships I picked for that role. The Aurora LN (which can be refitted with the same big box as the Aurora CL) and the Avenger Titan. I picked the Avenger Titan (Renegade Version) as my small carrier landing capable cargo ship as it's a decent enough fighter and it'll carry a decent amount of cargo with a bed completely enclosed within it's hull. I added on the Aurora LN as a backup to that since it can also load 4 guns and have the best shields and engine in the Aurora line while also having a bed for long range trips. If you want a Cutlass Black I would recommend getting one sooner rather than later as I suspect it's price will rise a lot when the updated version is put back on sale. The price point of the ship will help keep the sales of it down and I agree the way they talk about the ship does seem to imply it's going to be difficult to obtain in the verse. It doesn't look like CIG sold that many of them considering how many backers there are which is a huge draw for me to pickup the ship as I love to own rare ships, however its roles of basically scout and bomber are just too limiting for me to justify it. At any case this seems like a special ship that's worth hanging on to and I'll consider grabbing the $25 CCU for it in case I change my mind like I did with the Blade. For me comparing a Gladiator to an Eclipse is like comparing an Gladius to a Super Hornet as it's in a completely different tier, so I think it's a wise choice melting the Gladiator. I've read a few comments where people don't feel the ship isn't a threat and I would agree with that if you're comparing it to a fighter, however medium size ships like a Constellation, Carrack or Caterpillar I would say this is a huge threat. I believe it takes two Retalliator torpedoes to kill a Constellation, so if this ship does indeed come with the same size torpedoes and has the ability to lock the torpedoes on and fire all three at once, it can effectively one shot medium size ships before they even know they are under attack. Considering how popular medium size ships are there should be no shortage of targets. For light trade Shiv I would actually go the Freelancer as it has killer weapons and decent cargo hold, plus you can fit a Dragonfly in the back. If you needed extra cash you could also consider melting the Harbinger BUK as it looks to me like you have that role covered with your new ship. Kamikazi great choice getting the Merchantman, though I can't believe you didn't pick that ship up earlier. As to the Hoplite, I think you would be better served with a Carrack. Oh I picked the Banu Merchantman and the Xi'an Scout up during their original concept sale but I was actually looking for a ship between the Constellation and the 80m Starfarer which is what I thought it originally was. Then it kept getting bigger and bigger to the point that it had a wing span that was as wide as 2 Retaliators nose to nose and just as tall as one with the lower fin extended. This was all before flight became a thing and I thought it had got too big when the Star-G had a similar cargo capacity listed and had a smaller profile so I melted it. However after flight came out and I saw how a crowded space station actually handled I got a bit less concerned with it's size but at one point I had a Hull D and after I melted that I still had an Orion and I was hoping that it's arms could be used to ferry cargo. But then the Prospector was developed with it's unique expanding bag system which I have a strong suspicion will become standard for all mining ships so I no longer expect my Orion to be able to carry cargo. Actually until I see it in engine I'm not even betting my Star-G can carry any cargo outside of it's current internal bay so there I was stuck without a heavy duty cargo ship when CIG releases the Defender with images of the Merchantman which seems to have a smaller wingspan in relation to the main hull and it seems to be getting near capital ship size. Well I'm a sucker for capital sized ships and especially cheap capital scale ships and I already had a Constellation Taurus I had upgraded from a old $80 LTI M50 Unmelt for the $20 savings so I just added a Taurus to Xi'an Scout CCU I've had for awhile for another $20 savings and CCU'd it into a Redeemer then applied a Banu Merchantman CCU for a $210 Banu Merchantman. I can still unmelt the original concept sale one if something in the $350+ range (like the finished Genesis Starliner) interests me. I'm waiting to see what the Origin 600 turns out to be but I have a sinking feeling that the image that some people were calling the Sabre Raven might in fact be the Origin 600 and the Sabre Raven was just a CIG codename for the -REDACTED- making the Origin 600 a high end fighter. I'm kinda getting the feeling that people are about tired of seeing combat ships and if the ship that many were hoping will be Origin's answer to the Constellation Phoenix instead turns out to be Origin's answer to the Super Hornet there might be a minor explosion from the community. As for the Hoplite I'm leaving it as is for several reasons. For one I was able to get it for $190 with the $15 discount from the Reliant's price increase and another $20 Xi'an Scout discount CCU which isn't a bad deal for a Vanguard Warden equivalent with the added ability to carry troops and maybe a small buggy for the loss of the escape pod plus getting a sweet green paint job. For another I'm waiting to see what happens with the Origin 600 as I said before. It might be an answer to the Phoenix so it'll be in the $350 plus range (or exactly $350) and the Hoplite will serve as a nice CCU platform now that $0 CCUs for concepts are a thing of the past. If the Origin 600 turns out to be a super expensive fighter then the $225 price point will take the sting out of CCUing to one and if it's any cheaper than the Hoplite I'll probably just buy the Warbond version anyways. Especially if CIG continues the winning strategy of adding in-game loot to them that you can't buy outright. Maybe it's just me but the rear of this image looks an awful lot like the rear of the 85X which is supposed to be the new direction which Origin is headed in which also makes me think it might be the Origin 600. Deliverance I think thats a good idea and Ill melt down the Harbinger upgrade kit and pickup a Cutlass. That will leave me with $35 which ill spend on an Aurora LN and convert over to Dragonfly (Have a LN->Dragonfly conversion in my hangar atm). Most bang for the buck, Gives me a fighter, bomber, Long Range Connie\Tali Killer and heavy fighter\light cargo hauler plus the Dragonfly for ground work. I may spend the $15 and upgrade to the Hornet Ghost too, will have to add extra weapons (ballistics probably to keep sig down) later. This was the Cutlass and Dragonfly also work well as low-profile under-cover style ships when the outright stealth of the Ghost and -REDACTED- arent suitable. The Cutlass will have the space to carry the Dragonfly once they rework it right? Would seem odd if it couldnt. I will miss the Harbinger kit (Im not sure how far the -REDACTED- can venture from home vs the Vanguard which seems like it can fly forever before having to refuel) but that can always be purchased in the 'verse I suppose should the need for a long-range strike arise. Or just have the -REDACTED- ferried close to the target on a carrier ship and launch from there, its along the same size lines as the Hornet & Gladiator so Im assuming its Carrier capable. That sounds like a good plan Shiv and I can't see any reason as to why the Dragonfly wouldn't fit into the Cutlass after it's redesign as it's looking pretty big now. The Q&A had some pretty good information, though it was a shame they tip toed around the question of how many ships it would take to bring down the 890, Polaris or Idris. All this talk about stealth has me contemplating restoring my Sabre, though I think I'll wait to see how the 600 series comes out first before deciding what to do as I may need to put the funds towards that instead. I looked at the Sabre too briefly but a bit more than I wanted to spend. The Q&A for the *REDACTED* has been an interesting read. Longer range than the Carrier based Gladiator but shorter than the Vanguard sounds about right. Speed wise as fast as a Gladius but - maybe - only as nimble as a Gladiator or Vanguard. The unexpected part (which leads me to believe its bigger than weve been led to believe) is it is too big to fit on a Polaris (which was expected) and will be a tight fit on a Javelin (unexpected) as it implies it may even be too big to be carried on an Idris Frigate. My thoughts on the *REDACTED* are its the perfect ship to launch the opening strike in an operation. 1-3 of these would slip close to the target ship (Connie\Tali or larger) and release their payloads. Assuming the strike is unexpected one or two will cripple or destroy something like a Connie or Tali (obv assuming the Torpedoes strike home) and would damage a Polaris (Depending how many hit and where this could also cripple the Corvette). After this either a shoot and scoot with the guns to finish off a damaged target or bug out and let the next wave consisting of more combat capable fighters and bombers take over. *REDACTED* Opening Alpha Strike -> Vanguards or Talis escorted by Carrier based fighters. What is all this "redacted" stuff? I cannot find anything in the comm-links. Was it a jump point or one of the round the verse"s? 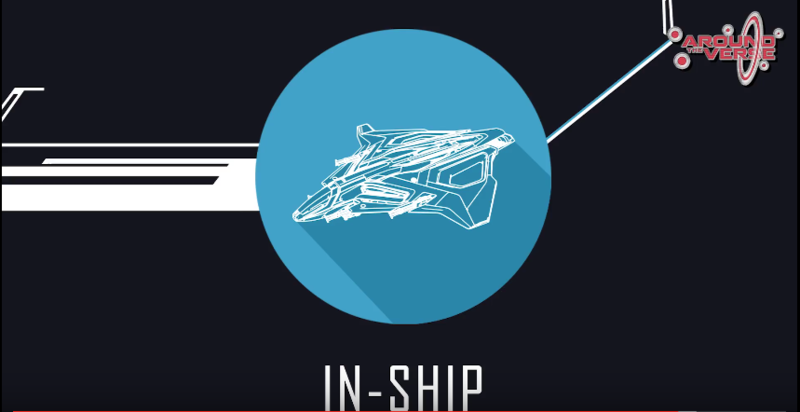 I heard that in the ship was designed to fit in the Idris based on a comment made in Jump Point, it wasn't allowed to have a wing span greater than 25 meters to memory. This makes it a great carrier based bomber with stealth capabilities imo. The last image I saw of the Cutlass looked like they were trying to have two designated landing spots for the Dragonfly in the back of the Cutlass Black. It also looks like you have a pretty decent stealth fleet going Shiv. I'm starting to wonder if the Vanguard Sentinel will have stealth components now after reading the Q&A. I went with the Harbinger myself because if they were going to make the Vanguard not very agile and slow anyways I wanted as much armor and as heavy weapons as possible and the Harbinger was always touted as being the heavy weapon platform in the Vanguard line. As for the -REDACTED- fitting in a Polaris I'm not too worried. Capital ships sent to Foundry 42 tend to grow and the Sabre has a 30m Wingspan and is supposed to fit with them folded in and they don't seem to fold in all that much really. If it cannot however that's also fine as long as it can still fit on a Idris which I think it will since it's likely needed for a mission in SQ42. I'm kinda happy that the single shot rotary launcher will be a thing. It'll require the -REDACTED- to remain on station a bit longer which could lead to more involved gameplay kinda like a sniper who has to change position after firing a shot or risk getting caught. Also I don't mind the idea that 5 -REDACTED- won't be able to swarm a Idris with 15 torpedoes at once. 5 will be bad enough. Getting capital ships instant killed by 5 solo players would not be fun. Wraith I answered your -REDACTED- question in the other thread you started on game packages. Last edited by Kamikaz1 on Sun May 28, 2017 7:52 am, edited 1 time in total.